Are you a Tradie with a Van? Have a problem storing your tools and spare parts? 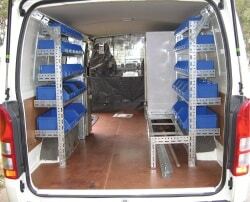 A Van Racking Kit may be the solution! Ideal for electrical, plumbing or appliance repair trades fitting out your trade van has never been easier! These Van Racking Kits are designed to provide a cost efficient solution for storing spare parts, tools and loose items in trade vehicles. Manufactured using robust, heavy duty slotted angle and supplied as a DIY kit.